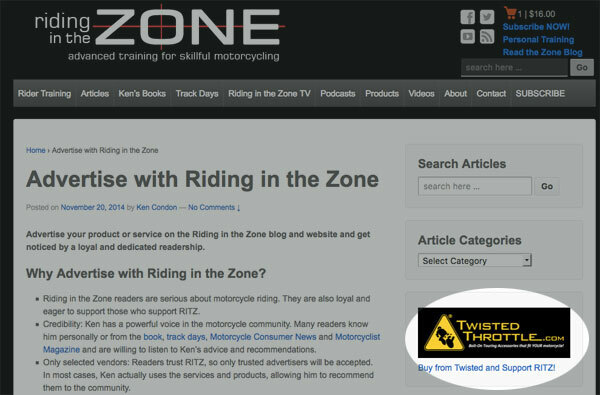 Advertise your product or service on the Riding in the Zone blog and website and get noticed by a loyal and dedicated readership. Why Advertise with Riding in the Zone? Riding in the Zone readers are serious about motorcycle riding. They are also loyal and eager to support those who support RITZ. Credibility: Ken has a powerful voice in the motorcycle community. Many readers know him personally or from the book, track days, Motorcycle Consumer News and Motorcyclist Magazine. Ken is also chief instructor for Tony’s Track Days. People listen to Ken’s advice and recommendations. Only selected vendors: Readers trust RITZ, so only trusted advertisers will be accepted. In most cases, Ken actually uses the services and products, allowing him to recommend them to the community. Professional banner design service: For those who don’t already have artwork for a banner ad (see below). 1,800 subscribers receive emails promoting reviews, products and new articles. Your ad will link to your website or product page. Analytics Reports: See your stats at any time to evaluate effectiveness. Ad appears on ALL blog pages. Price includes monthly mentions in the RITZ Facebook page with links. Small 250px by 75px banner- $60. Medium 250px by 250px banner- $80. Large 250px by 500px banner- $100. Footer 900px by 100px banner- $240. Consider commissioning a 500-600 word blog article reviewing your company or product. Blog articles will be seen and shared on social media for greater exposure and will be included in RITZ email Newsletter to subscribers. Price: Contact Ken to discuss. Discounts apply if you commit to more months upfront: Take 10% per month off monthly ad rates (up to 4 months- 20% total). You can supply your existing banner ads, or supply me with your logo and images and I’ll create the ad for you for an extra cost. Static and animated ads are available. Logo must be provided.